Super Bowl LIII is not only about two of the league’s best offenses squaring off against one another — New England and Los Angeles — it’s also about America’s other favorite pastime: gambling. The total amount bet on the Super Bowl1 has risen from $40 million in 1991 to more than $158 million in 2018, and much of that growth has come from “props” or proposition bets. Another interesting wager is on the length of Gladys Knight’s rendition of “The Star-Spangled Banner.” Several offshore books have set the total for the anthem at 1 minute 47 seconds, and the implied odds for both the under and the over were set at one book at -115 — a 53.5 percent implied probability — on both sides.2 The implied probabilities being equal indicates that the book has no real opinion on the length of Gladys’s performance — they just want to take a percentage from each side of the wager and hope bettors will place their bets evenly on both. But is Knight performing the anthem in over/under 107 seconds really close to a 50 percent proposition? Or is there evidence that might convince us that the oddsmakers got the probabilities wrong? To find out, I went to Youtube and watched 40 Super Bowl national anthems from 1979 to 2018. I eliminated any anthems with trumpeters (there were two) and then started timing the anthem from the moment the singer first started to sing and ended the timer after the completion of the first utterance of “brave.”3 Using this methodology, the 40-year average of all national anthem singers4 is 106.1 seconds, roughly in line with the total set by the books. So the total is correct so far as the average goes, but it also seems lazy. Surely there are other factors that might help us better predict how long Gladys might sing. For starters, the performance time of the anthem has changed as the Super Bowl has grown to become the unparalleled cultural phenomenon we now enjoy each year. As the pomp, circumstance and viewership have increased, the time anthem performers spend on the stage has also risen. So while anthems have gotten longer over time, the 40-year average is not fully accounting for that trend. When you do account for it5 the best forecast for the 2019 anthem is actually 119 seconds, 13 seconds over the 40-year average. 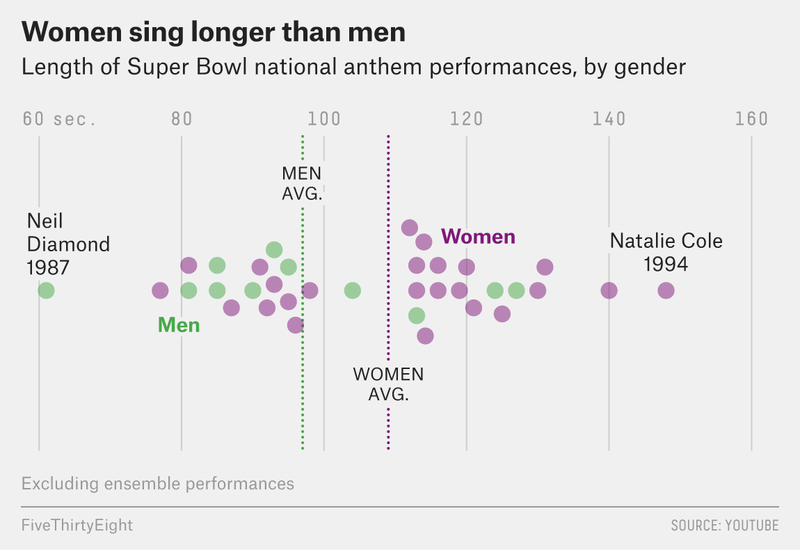 Gender of the anthem singer is also significant. 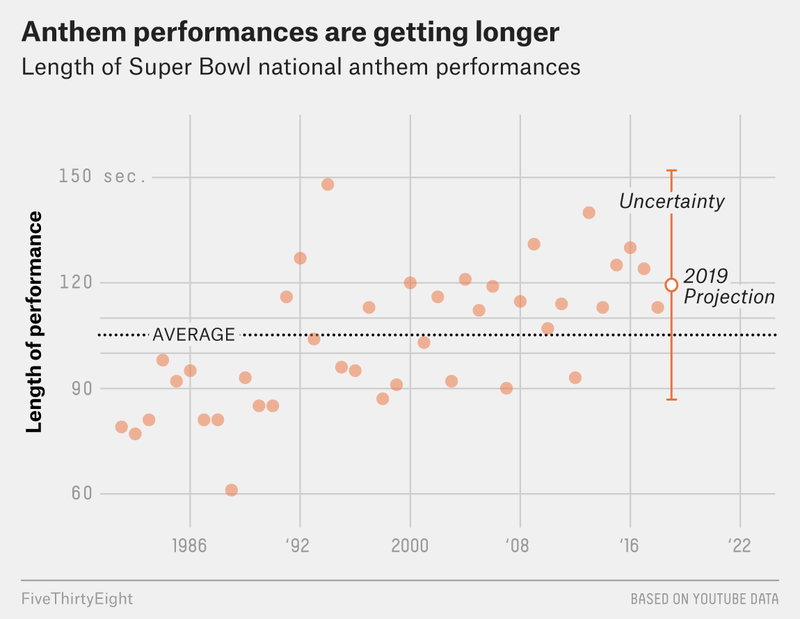 Men tend to sing the anthem more quickly than women — though not many men have sung the anthem in recent years, when the anthems have been getting longer overall. Still, the all-time shortest anthem performance was by a man — the incomparable Neil Diamond — who got in and out like a boss in a cool 61 seconds. And the longest anthem ever performed at a Super Bowl was by the unforgettable Natalie Cole in 1994, which clocked in at a diva-esque 148 seconds. Finally, Knight herself appears to be a singer who knows how to stretch a note. Using whosampled, I identified 31 covers performed by Knight and timed the cover performance of each using similar criteria to the anthem timing. Knight’s covers were 7 percent longer than the originals on average, good for a bonus 12.7 seconds of soothing soul per track. In perhaps the best comp to the national anthem — “Ave Maria,” a soaring, vocal-heavy standard covered by hundreds of artists — Gladys’ performance was 37 percent longer than the standard version. Taking a larger view, only two anthems in the past 15 years have been performed faster than the 40-year average of 1 minute 47 seconds. And when I looked at the age of the anthem singers, I found no significant correlation between age and performance time.6 On the other hand, we can look at one of Knight’s previous performances of “The Star-Spangled Banner” itself, which is solid piece of evidence against the over, running for 92 seconds. It was, however, performed 28 years ago. All things considered, the bookmakers appear to have this line wrong on Gladys, and her upcoming anthem performance is probably going to go over 107 seconds. Researching a single prop was a lot of work, and it’s understandable why books might not want to put this level of effort into each and every bet they publish. But it does imply that there are profitable edges for some Super Bowl props. Using the Twitter machine, I threw up a bat signal for a gambling expert to help me confirm my priors. Rufus Peabody, a professional sports bettor and former ESPN contributor who is well-known in gambling circles for the scale and volume of his Super Bowl prop wagers, agreed to help. I’ve been keeping an eye on the Gladys anthem line, and it hasn’t moved all week. I was tempted to bet the over, but when I was confronted with the prospect of having to convert real money into Bitcoin in order to place a bet on an offshore site, I decided to abort. When I looked around for somewhere to place the bet in Las Vegas — where they accept actual money — I struck out. Peabody explained that prop bets like anthem length are illegal in Las Vegas because of restrictions on the types of sources casinos can use to “grade” or determine the outcome of a bet. Even if it won’t net me any cash, I’ll be pulling for Knight to go over regardless. I want her to belt out that last note in “home of the brave” for an egregiously long time. After all, my Twitter credibility is on the line, and that’s serious business.